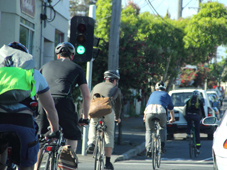 It is popular to bike Melbourne - though not quite as widespread as European cycling. 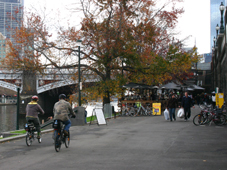 Melbourne has many picturesque bike paths, on road bike lanes and informal bike trails. It is the Australian cycling city and the bicycle is important part of Melbourne's life. Melbourne is relatively flat. It has a network of bike paths and parks connecting the suburbs with the city and each other. This allows people to beat the traffic and commute by bike. And even more special, there are many Melbourne bike paths along the creeks, the Yarra and the Bay that make a good day out for the family or serious riders. Following the European trend, many Melburnians prefer to use comfortable bikes as well as road bikes, rather than the solid mountain bikes that had dominated cycling for a few decades. Today, you see as many retro and new comfort bikes, as well as step-throughs - ridden with baskets, comfort clothes, business suits or skirts - as you see the speedy Lycra. There is a drawback though to Melbourne bike riding: you have to wear a helmet, no matter what your speed. So you dont quite get the same casual biking as in Europe. This has also slowed the uptake the Melbourne Bike Share scheme , which has been a success around the world. The City council produces small fold up maps, mapping the bike paths around the city and suburbs. You can get them free in most bike shops. They will show you the off-road bike paths – shared with pedestrians, on-road bike lanes and informal bike roads through the suburbs. 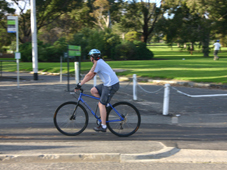 With this information you can work out how to best bike Melbourne or get to your destination. There is nothing quite like the fresh wind in your face, cruising on your bike, and beating the traffic or crowded morning trams. Avoid the large roads and check the bike maps. The inner-city suburbs are the most frequented by cyclists. Just north of the CBD you have Carlton, Carlton North and Brunswick; Fitzroy, Fitzroy North and Northcote; there is North Melbourne, East Melbourne, Abbotsford and Richmond; and South and Port Melbourne southwest of the CBD. Each of these, have smaller streets that serve as official or unofficial bike roads. These will lead you, often through tree lined streets, through these attractive suburbs. Then there are the off-road shared bike and foot paths along the creeks, the Yarra and many parks that make for leafy and picturesque riding, where you feel you are out of the city straight away. There are bike trails in the suburbs further out. However, apart from the main cycle trails, most of these are the unofficial paths cyclists have forged through the quiet streets. Again, it is good to map them out for yourself before your trip to ensure the most pleasant and safe journey. The city of Melbourne has created a free bike pod for commuters on the lower floor of the City Square car park (corner of Collins and Swanston Streets). This is where you can get changed, have a shower and freshen up before hitting the office. So, you dont actually have to bike Melbourne in your work clothes. However, biking in the CBD is not great. Except for Swanston Street, which is closed to through traffic, there are only very narrow bike lanes on the other streets – and these are often blocked by turning or parking cars. If you can stay on the bike paths surrounding the city, along the Yarra or in the Docklands you fair much better. Melbourne now has a Bikefest during the end of November: a celebration of Melbournes eclectic bike scene and the two-wheeler in everyday life. It is showcasing fashion, textiles and accessories by Melbourne's designers that are associated with the ‘most desirable of all functional objects, the bicycle’. There is also a collection of bike stories, weird and wonderful bikes, artworks, a ride-in movie and laneway cinemas. 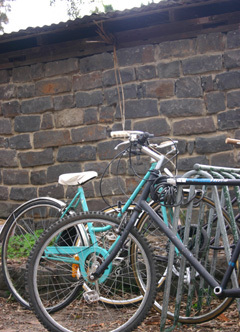 There are many opportunites to bike Melbourne and surrounds on many off-road bike path and trails. Many of these follow along the creeks, the Yarra, and the Bay and are shared by pedestrians, dogs and some of them horses. While these bike trails can get busy and riding a bit of a juggle close to the city, there is ample opportunity to get away from it all on these Melbourne bike paths. We find them real fun, a cheap day out, pleasure and instant relaxation. Often you don't feel you are in the city any longer. They are their own world with the suburbs and traffic at a distance. Many of these trails you can ride one way and catch the train back or vice versa. You can also take part of any of the Melbourne biking tours, which provide great company and an opportunity to explore parts of Melbourne you would perhaps not get to yourself.